Melisa from Melisa's Crafty Creations here this morning. Today I have a fun bookmark to share with you. My oldest son Matthew loves reading so I thought I would make him a bookmark. The tag is from the Layered Labels 1 Cutting file. The muffin is from the Valentine Sweets Cutting file. Both of these are from Pretty Paper, Pretty Ribbons. The twine is from The Twinery. Here is a shot of the wobble in action. I thought it would be fun to add a little face to the muffin. He always gets a kick out of the faces. The sentiment is from Jaded Blossom's Funny Valentine Stamp set. 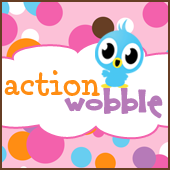 You can buy some Action Wobbles HERE. Stop on over and check it out.